A low, sprawling mass barely reaching 40cm at best, unless supported by other plants. 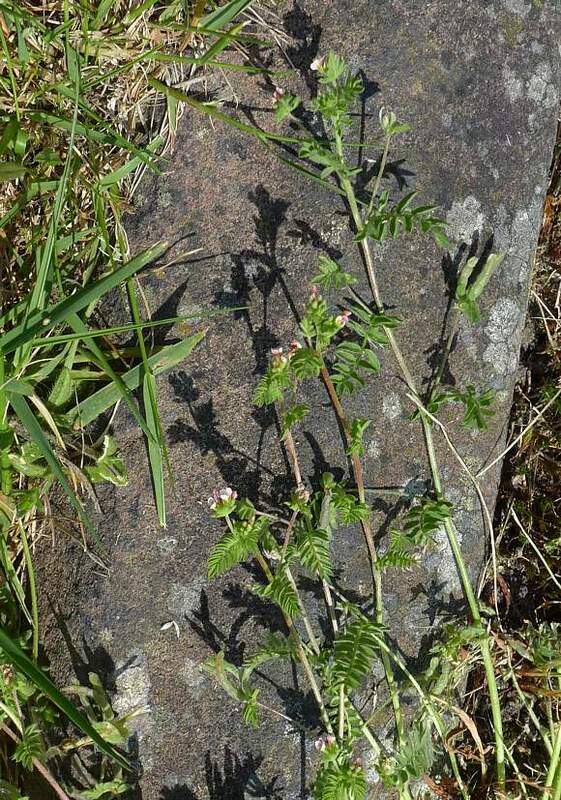 The stems are up to 40cm long. Kerb-crawling along the paving slabs. The flowers are in tiny bunches of 3 to 8 at the end of stems. 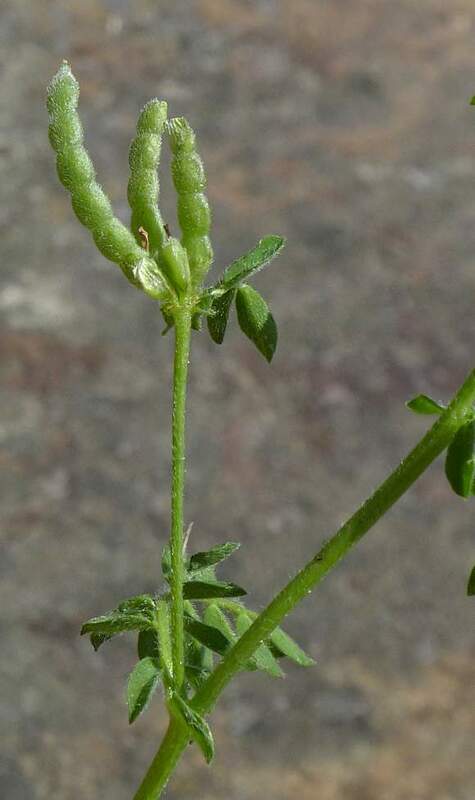 Held up by your Author so as to better see the alternate stems, the lower already turned to curved seed-pods. 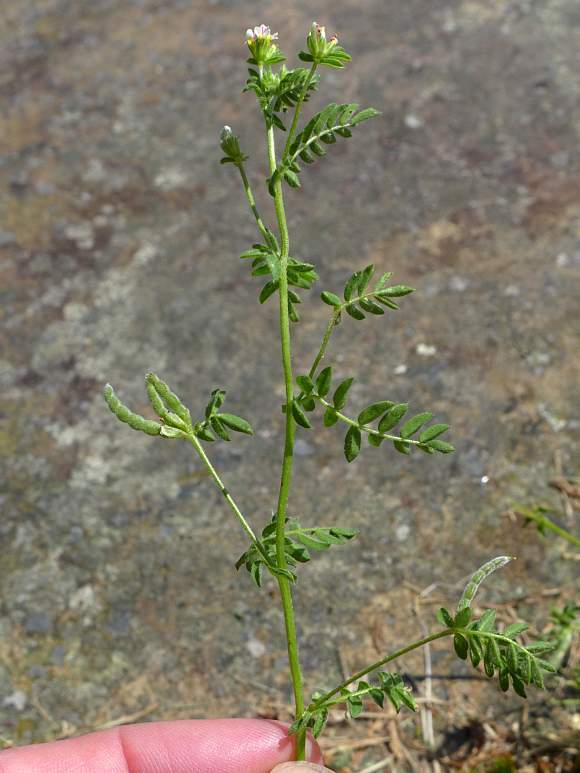 Leaves are pinnate with many small lanceolate leaflets. Each flower-head stalks have a pinnate leaf just below them. 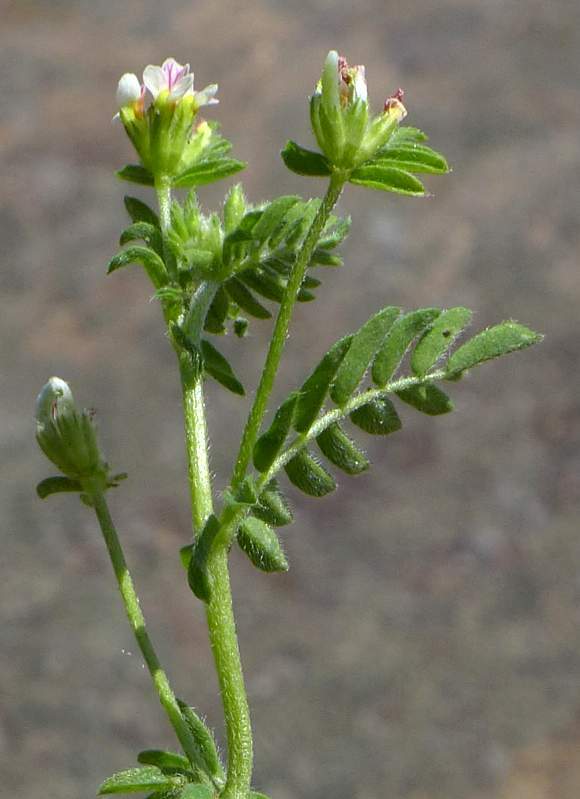 The 'leaves' just below each flower-head are not leaves, but bracts. 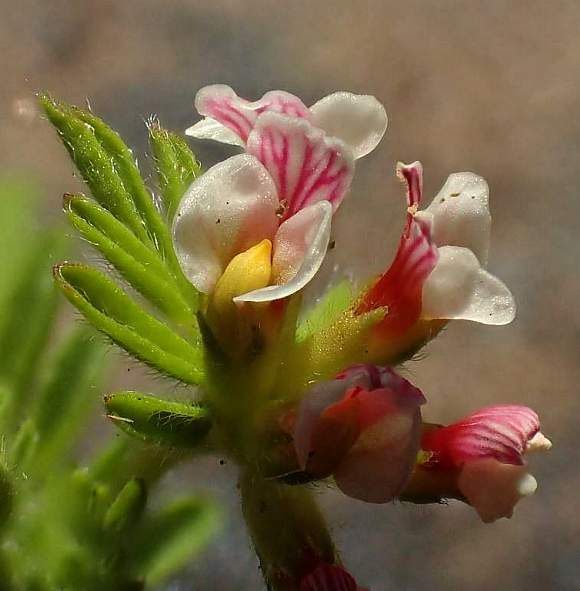 A prostrate to sprawling annual growing up to 30cm: the upright leaves and the flowers coloured in 3 colours: white, red and yellow on the right. 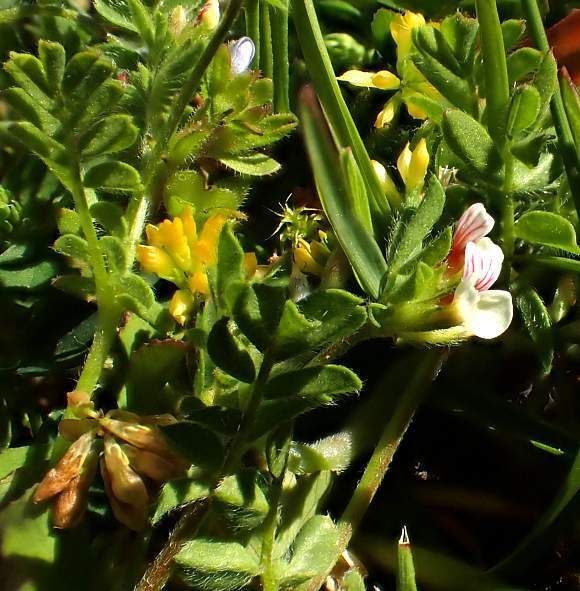 The multi-flowered yellow interloper is Lesser Trefoil (Trifolium dubium); its brown seed heads are in the lower left. The flower-heads have between 3 and 8 flowers per head, however, contrarily this one has but two flowers! 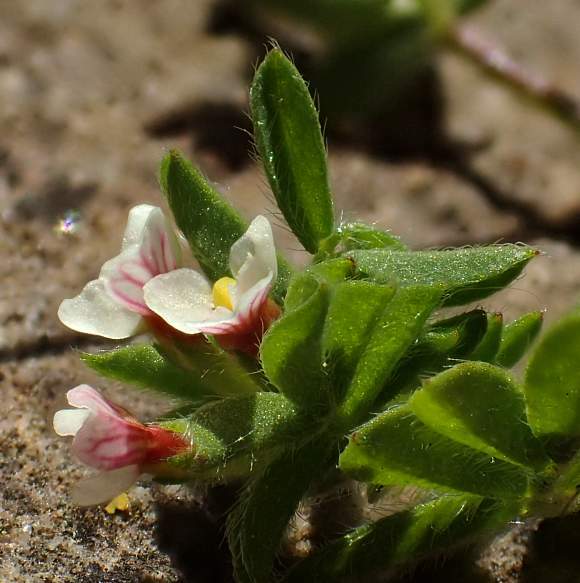 The flowers are a small 3-5mm long but a tiny only 1 or 2mm across. 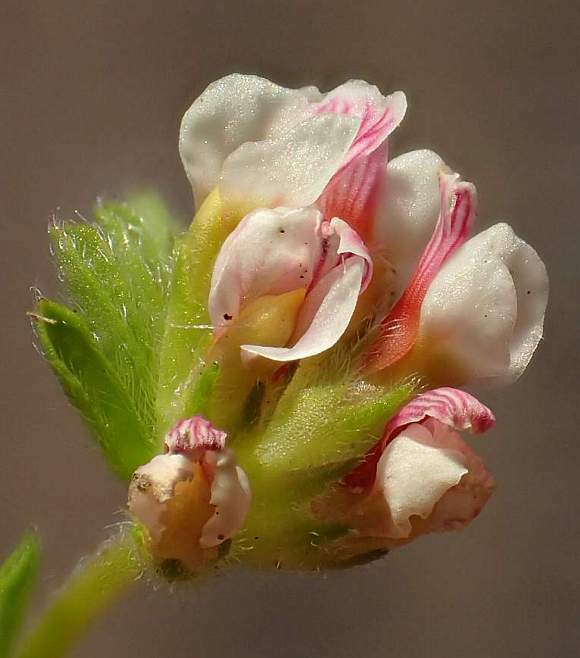 The leafy bracts on the flower-head are at least as long as the flowers. But this flower-head may have the full complement of flowers, 8. 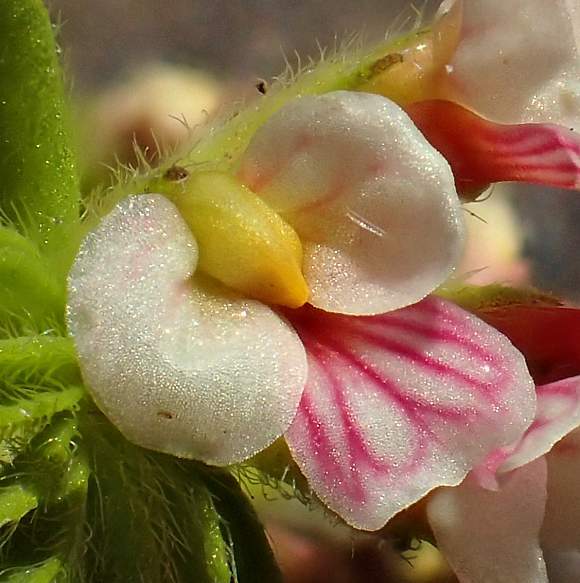 The flowers have a pinnate bract at their base. 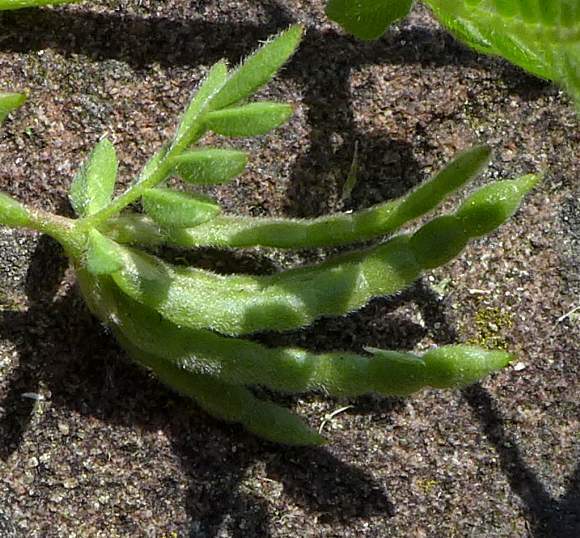 Leaves and bracts with fine long white hairs (relatively speaking). 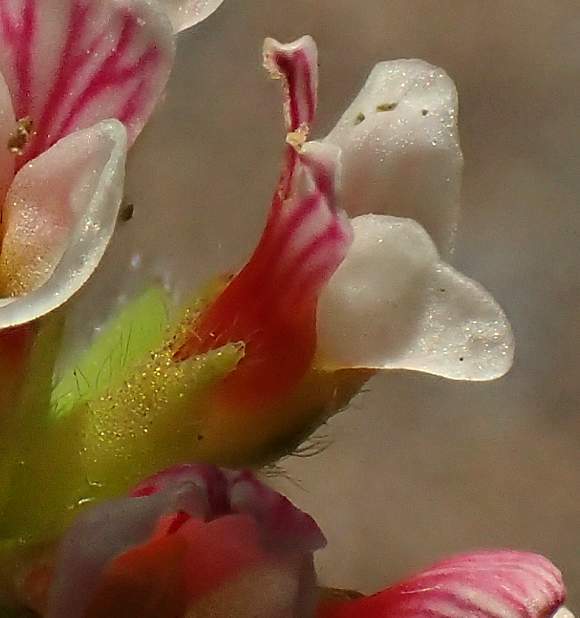 The pale off-green sepal tube has 5 blunt teeth. 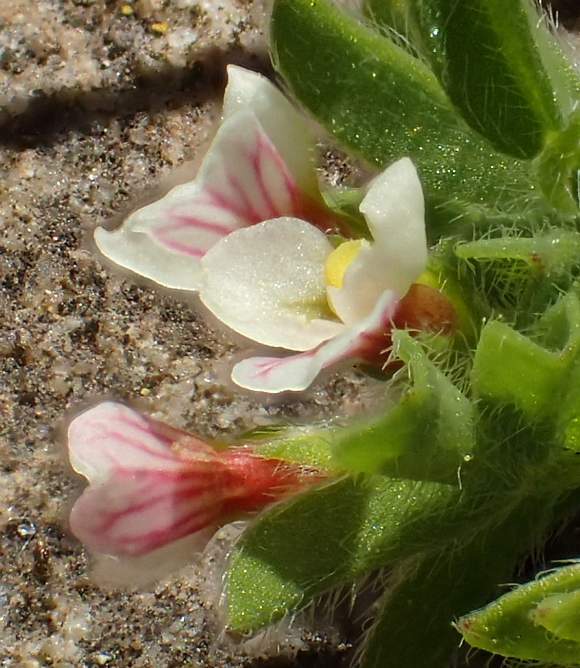 The single larger banner of the flower is white with several forked red stripes. Two slightly shorter wings either side are plain white. The two yellow wings are cupped together in the centre. 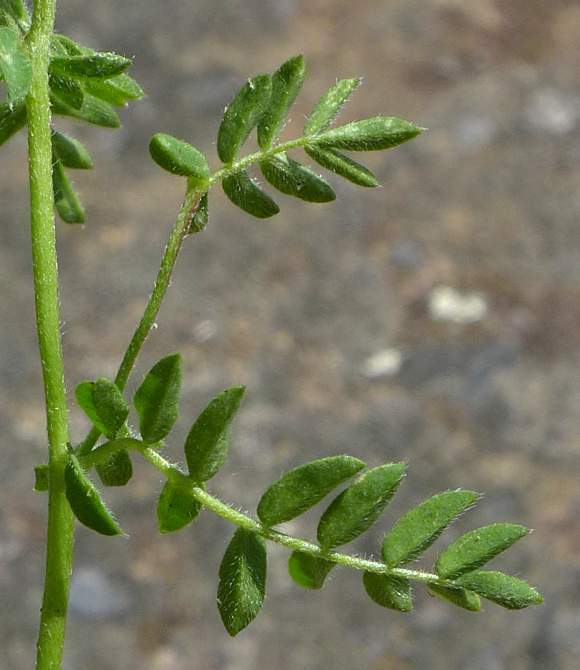 Leaves have many (9 to 27 or 4 to 13, depending upon the reference book) lanceolate leaflets with a terminal leaflet at the end. Leaflets between 2mm to 4mm long. A closer look of bird's-foot 'claws', which are in bunches like bananas of 3 to 8 pods with each pod being waisted into between 4 to 9 sections. 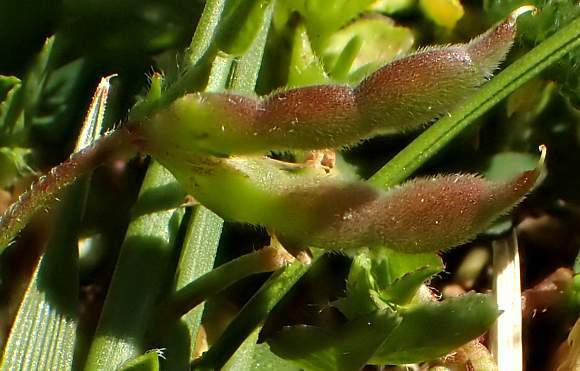 The seed pods are hairy with short hairs and when there are only 2 or 3 pods resemble the claw of a bird. 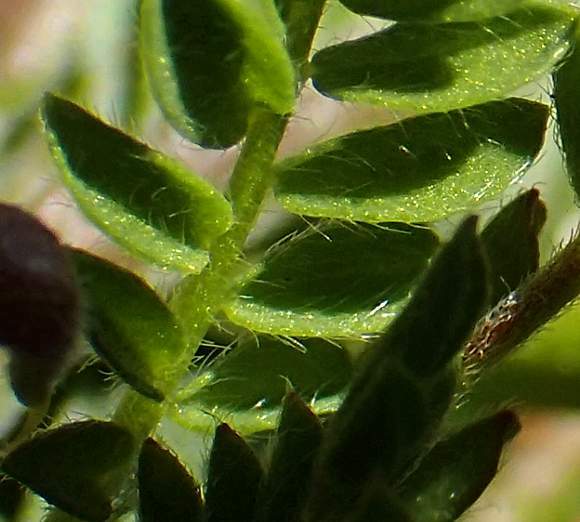 The claw-shaped birds' 'foot' of seed pods, between 10mm - 20mm long. The ripe fruits (pods), 1 to 2cm long are slightly diametrically compressed. 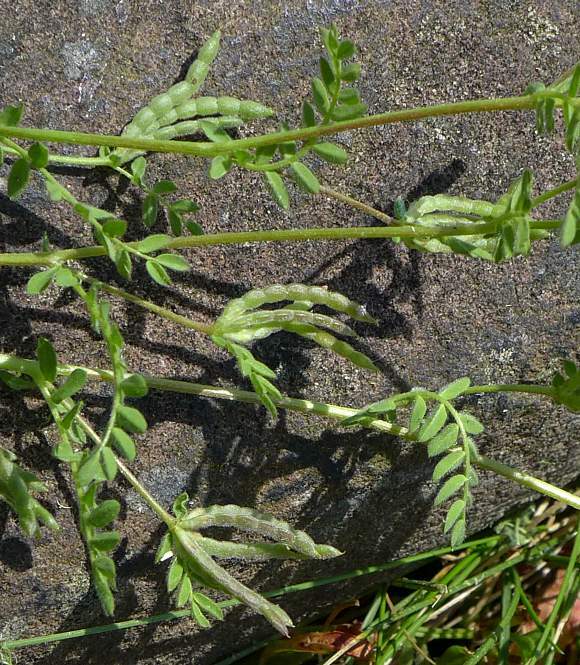 Not to be semantically confused with : Bird's-Foot-Trefoil (Lotus corniculatus), Bird's-Foot Clover (Trifolium ornithopodioides) or with their other species [all plants with similar names which all belonging to the same Pea Family (Fabaceae) as Bird's-foot]. No relation to : Bird's-foot Sedge (Carex ornithopoda) which is a Sedge, Bird's-Nest Orchid (Neottia nidus-avis) and orchid, Bird's-eye Primrose (Primula farinosa) a primula nor to Bird-in-a-Bush (Corydalis solida) a member of the Poppy Family. 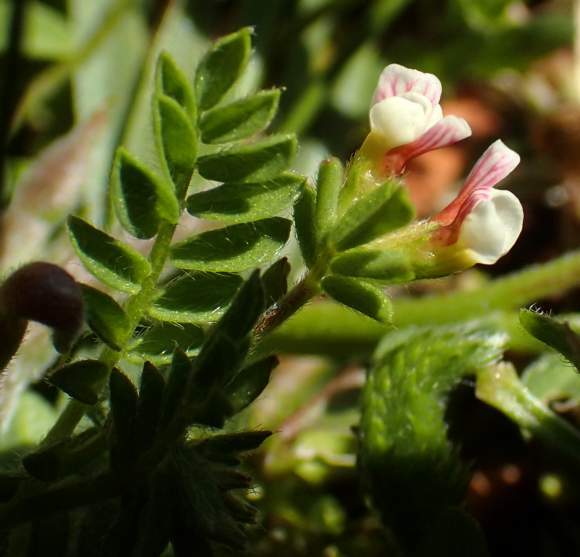 With its small but part-coloured flowers, this is a plant that is easy to recognise, providing you can actually see the small flowers whilst standing. Some similarities to : Orange Bird's-foot (Ornithopus pinnatus) which has flowers that are mostly deep yellow but with orange markings. They are more orange when still closed. At 50cm tall this has longer stems than Bird's-foot, but is still recumbent to ascending, with only 5-15 leaflets on a leaf and just 1 to 2 flowers in small 'bunches'. 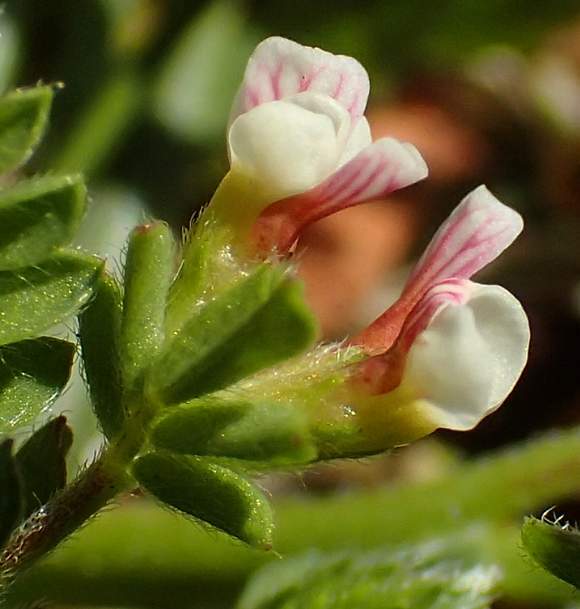 Orange Bird's-foot is a very rare native plant [RRR], occurring in the Channel Islands and Scilly, but naturalised now in East Gloucestershire. 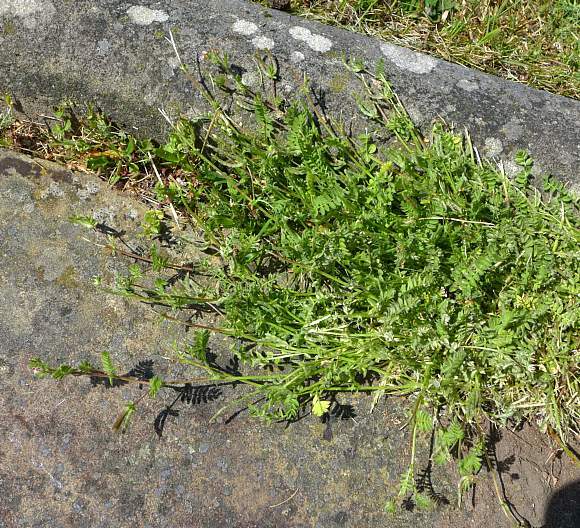 Slight resemblance to : Two other rare but introduced and naturalised casuals occur, Yellow Serradella (Ornithopus compressus) which is yellow, and Serradella (Ornithopus sativus) which occur in one or two places in the far South of England. Bird's-foot is locally common and occurs on usually acidic dry or sandy or gravelly soils especially beside paths or tracks, forest tracks, heathlands or dunes, but usually avoiding alkaline soils. The basal rosettes of leaves hug the ground.